Game Changer-1938 black roan. Sired by Governor Blue (r), out of Mary Roan (r). Chasing Stars-1939 chestnut roan. Sired by Anacacho Shamrock (r), out of Judy Starr (r). 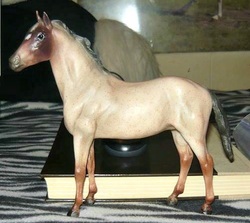 Whirling Color-1954 bay roan. Sired by Gay Bandit (r), out of Chiefs Whirling Columbine (r). Sweet Dictator-1955 brown roan. Sired by American Dictator (r), out of Sweet As Honey (r). Stars A Whirlwind-1955 bay roan. Sired by Gay Bandit (r), out of Chiefs Whirling Columbine (r). Spot The Fox-1963 bay roan. Sired by Bourbon Gay Montgomery (r), out of Valiant Fox (r). Valiant Bourbon Mist-1964 bay roan. Sired by Bourbon Gay Montgomery (r), out of Valiant Fox (r). Lady Bountiful-1982 chestnut. Sired by Kourageous Kalu (r), out of Lady O'Goshen. Lady Gone Clubbin-1983 bay roan. Sired by Soda Club N Fuzz, out of Lady O'Goshen. 2007-Gone Tempest, bay roan colt (x Maelstrom Nyte) o/b Shadow Wolf Stables. 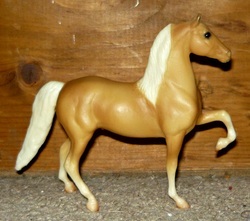 Lady Of Golden Rays-1984 palomino. Sired by Stars Go Sea (r), out of Lady O'Goshen. ​2007-Treasured Fortune, gray (bay based) filly (x Treasured Island) o/b Shadow Wolf Stables. 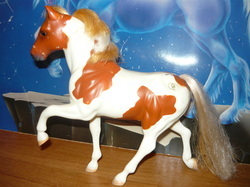 Vintage Sky N Lace-1988 chestnut tobiano. Sired by CH Skywatch (r), out of Vintage Lace. Bred by Indigo Creek Stables. 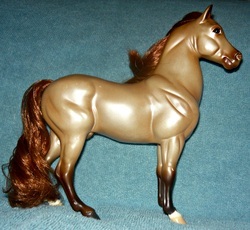 Spark The Night-1989 gold champagne tobiano. Sired by Chubasco (r), out of Sparkle Plenty. Bred by Indigo Creek Stables. 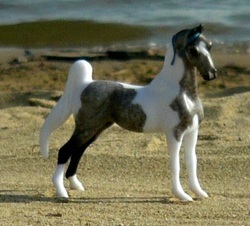 Our Flashy Aurora-1990 gray (bay base) tobiano. Sired by Our Grey Dawn (r), out of Honey Wind (r). Missed Discovery-1990 chestnut. Sired by Standing Room Only (r), out of Mount Joy Top Chice (r). Bred by Shadow Wolf Stables. 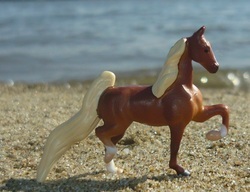 OF Breyer, Mini Whinny, Acorn. 1996-American Made, bay tobiano filly (x Taking Delight) o/b Shadow Wolf Stables. 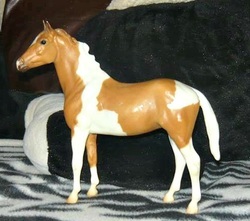 Desperados Affair-1990 buckskin tobiano. Sired by Another Affair (r), out of Des Magic (r). Bred by Shadow Wolf Stables. 2002-Independent Affair, buckskin tobiano filly (x Island Mischief) o/b Shadow Wolf Stables. Admirals Moon Inferno-1991 dapple rose gray (bay base). Sired by Moonbeam's Infero, out of Contract's Lady Admiral. Bred by Indigo Creek Stables. 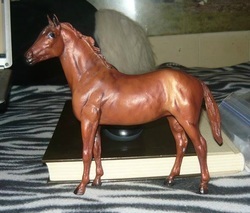 OF Breyer Paddock Pal/Lil Bit. 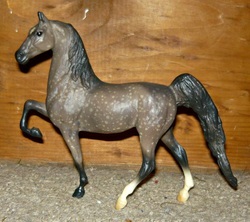 Lady of the Lake-1992 gray (chestnut base). Sired by Silver Illusion, out of Lady In Waiting. Bred by Shadow Wolf Stables. Midsummer Nights Dream-1993 bay tobiano. Sired by Carey's Night Of Love (r), out of Desert's Indian Squashblossom (r). 1998-Newbie Alert, bay tobiano colt (x Burning Inferno) o/b Pied Piper Ranch. Beaus Darling-1996 buckskin frame overo and sabino. Sired by Beau Decision (r), out of Modern Darling. Bred by Shadow Wolf Stables. Commanding Rhythm-1997 buckskin. sired by Anachaco's Gold Commander, out of Sahara Rhythm. Bred by Legacy Farms. Lake O Secrets-1997 chestnut tovero. Sired by Secret Of The Vale, out of Lady Of The Lake. Homo for tobiano. Also has splash. The Magic Touch-1999 gold champagne. Sired by The Magic Mix (r), out of Stonewall's Golden Silver (r). 2004-Island Magic, chestnut filly (x Island Mischief) o/b Shadow Wolf Stables. 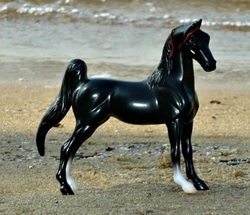 Marked Jewel-2000 black tobiano. Sired by Broadway Jewel, out of Boknea. Bred by Pied Piper Ranch. SK Ambitious Lady-2001 black. Sired by SK Supreme Ambition, out of Lady of the Lake. Bred by ? 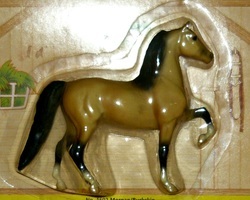 OF Breyer, SM, ASB from the hospital set. 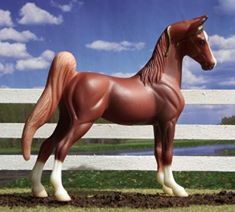 Societys Enchanted Lady-2002 chestnut tobiano. Sired by High Society, out of Silverfox Enchanted Lady. Bred by Twin Springs Stables. OF Grand Champion, 2000 National Show Horse mare, Melody. 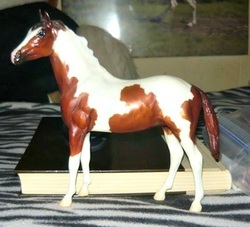 Wild Tyme-2002 chestnut tobiano. Sired by Wild & Wicked, out of Lake O Secrets. 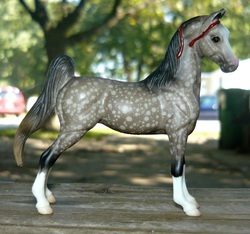 Hot Flashy Aurora-2005 gray (bay base). Sired by Hot Charming Steel, out of Our Flashy Aurora. Rhythm Konnect-2006 sooty palomino. Sired by Kinex (r), out of Commanding Rhythm. The Golden Chardonnay-2006 gold champagne. Sired by Outta The Bottle, out of Moregolds Shekina (r). Neverroan-2007 bay roan tobiano. Sired by Nevermore, out of Winter Mist (r). Bred by Legacy Farms. Candlelight And Wyne-2008 gold champagne. Sired by Outta The Bottle, out of Candlelight And Stardust (r). Peppermint Bark-2012 bay silver splash. Sired by Nutcracker Prince, out of Amuakua. Bred by Legacy Farms. Kinex This Roan-2012 chestnut roan. Sired by Kinex (r), out of Neverroan. Voodoo Compass-2013 Amber Champagne. Sired by Voodoo King, out of Golden Compass. Bred by Legacy Farms. Neverwyne-2014 amber champagne roan tobiano. Sired by Outta The Bottle, out of Neverroan. Societys Shadow Wyne-2014 Silver classic champagne sabino. Sired by Outta The Bottle and out of Shadow Society. Bred with the help of Legacy Farms.